Well, hello! It’s Courtney (Melissa’s daughter) here today! Some of you who have been around The Inspired Room for awhile might remember a few years ago when I moved into a tiny bedroom, (actually it was probably intended to be an office) on the entry level of my sister Kylee and brother-in-law’s Seattle townhouse. By little, we’re talking less than 9 feet by 9 feet with a sliding door on one wall, and a bit smaller because of an angled wall. At first, I wasn’t even sure if I could fit a twin bed in here! 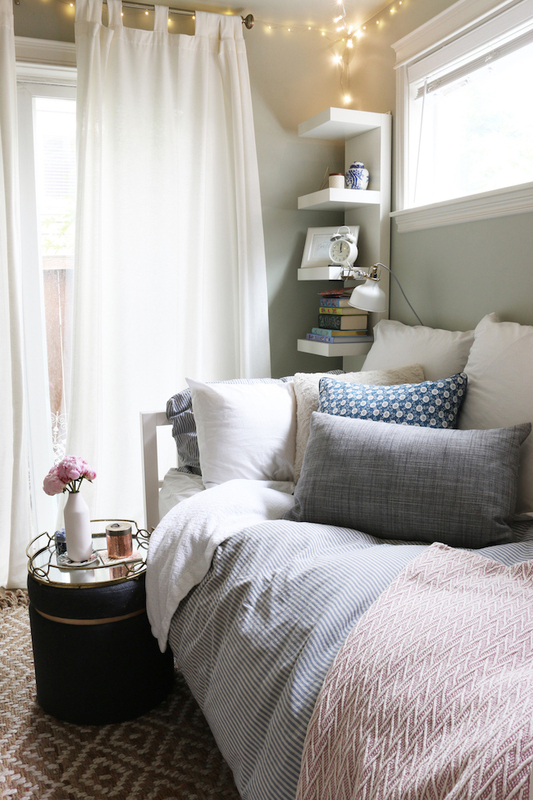 With a little creativity and very intentional choices, this room became a really comfortable spot. It’s still a small space for sure, but I decided to make the most out of its coziness. I completely love how it turned out. I can’t even believe it’s been almost three years now that I’ve lived here! When I first moved in, I had been out of college for a year and had just started my dream job–working for The Inspired Room full time. 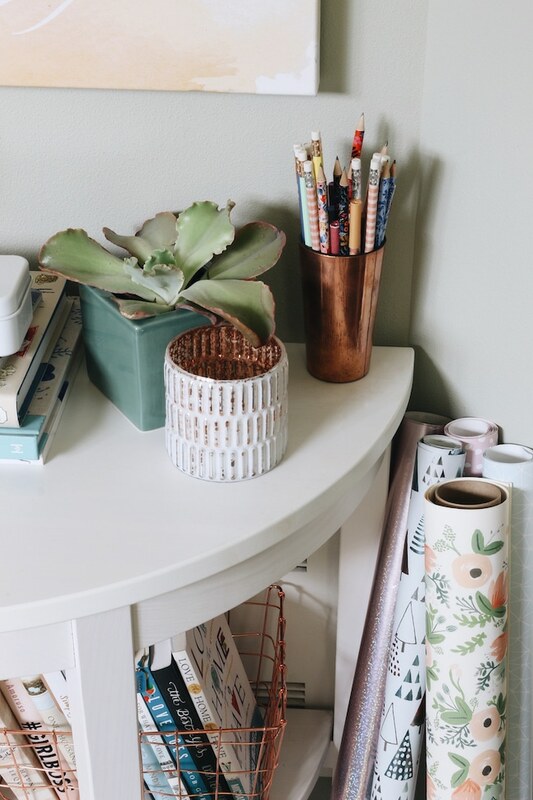 I shared this empty room on the blog with high hopes that I would document the whole decorating process, but here we are a few years later and I’m just sharing the reveal! You’ll have to forgive me, ha! :) I’ve been a little bit busy since then, along for the ride throughout every project, blog post, and book creation. So now that I’m finally here to show you my finished room, it seems like the appropriate time to share that I’m actually MOVING. Like, today…as you read this blog post. I’m so excited to be moving to my very own, very first apartment! Eeee! It’s been in the works for awhile, but Seattle is a spendy city to live in so I’ve been taking my time and enjoying living here until I found the right next spot. I cannot wait to show you all my new home. I can’t wait to get in there and start making it my own! I won’t promise how frequently I will do blog posts on here because we know how that went last time. ;) But I can tell you that there’s a strong chance that I’ll have a lot more to share. If you want a sneak peek of my new place, come follow me on Instagram! I’ll be sharing Insta stories TODAY and this weekend throughout the moving process, and more stories and photos as I get settled. But now, back to my current room! This room has treated me so well. It’s been the coziest little nest. 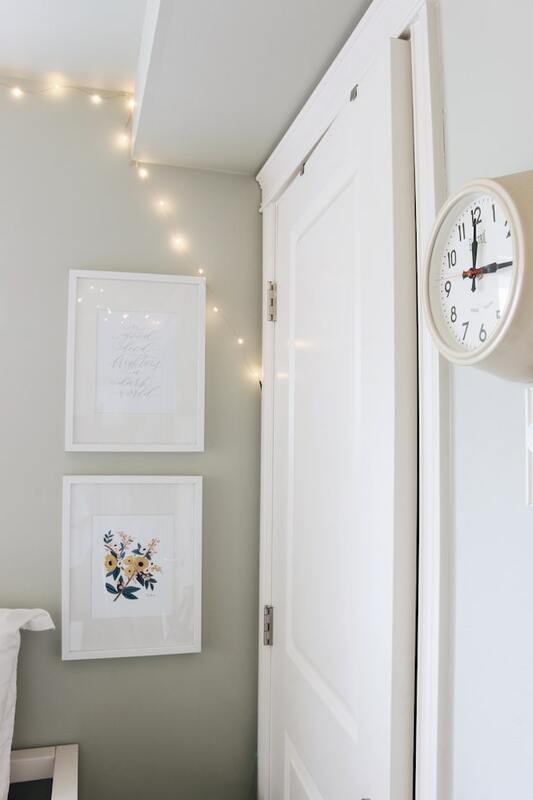 I love all the natural light it gets throughout the day–such a game changer in a small space. It has its own bathroom attached and a closet. A very tiny closet, but enough room to hang a few things and tuck away some clothes! I’ll show you a peek into the closet and my other storage later on in this post. If there was one thing I knew before I moved into this space, it’s that I was going to need to be very intentional with my furniture choices to make them as functional as possible. First and foremost, my daybed! 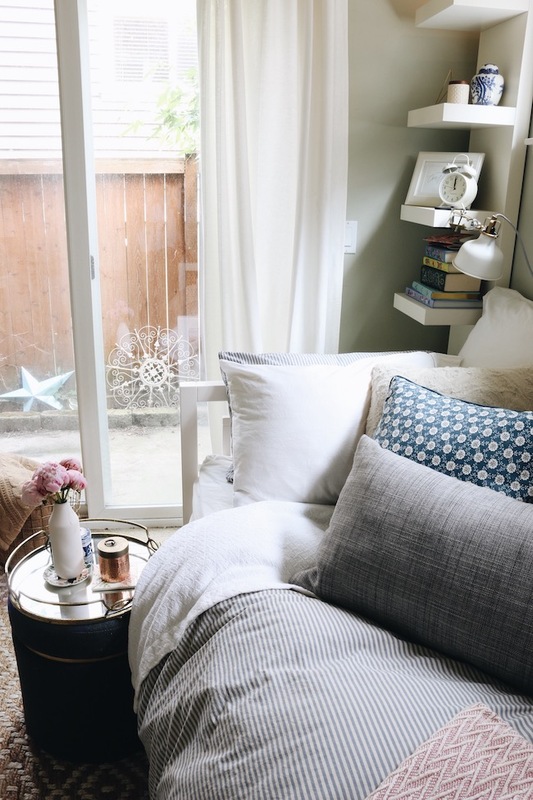 I considered lots of daybed options (I shared a round-up here), but I’ve been so happy with the one I chose. 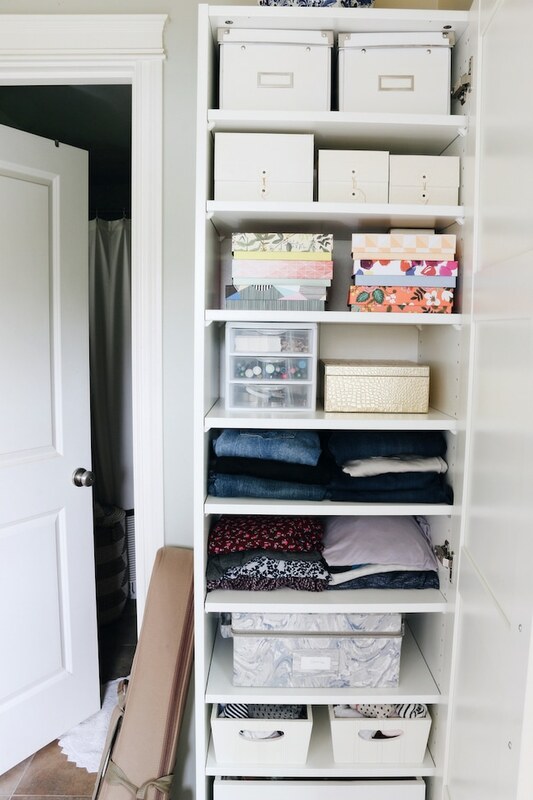 I utilized the space below with storage boxes–no wasted space in here! I filled the bed up with lots of cozy pillows including three firm Euro pillows in the back. 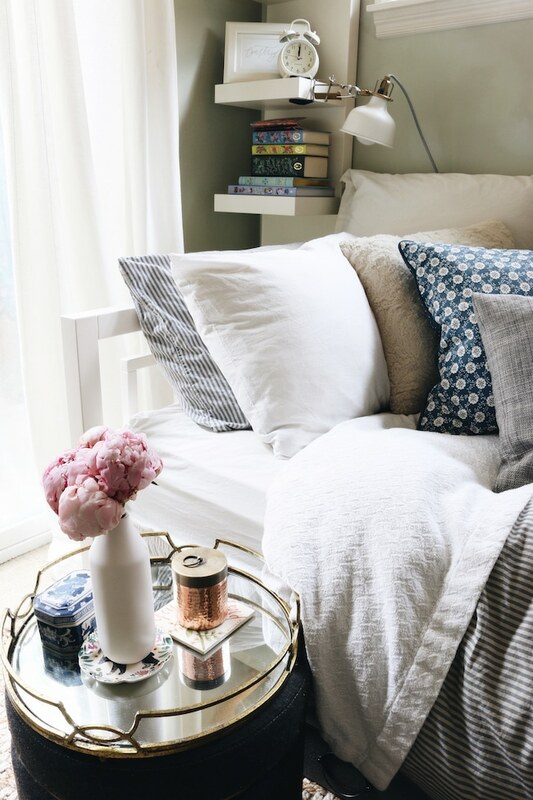 I plan on using the daybed as my sofa in my new apartment–just as I hoped would be the case when I first bought it! The shelving unit to the left of my bed is called the Ikea Lack Shelf. I don’t think there could have been a more perfect option for this small spot! It not only was great for displaying books and accessories but it also held a clamp light for reading. The shelf has the option of being hung up on the wall, but I didn’t do that. 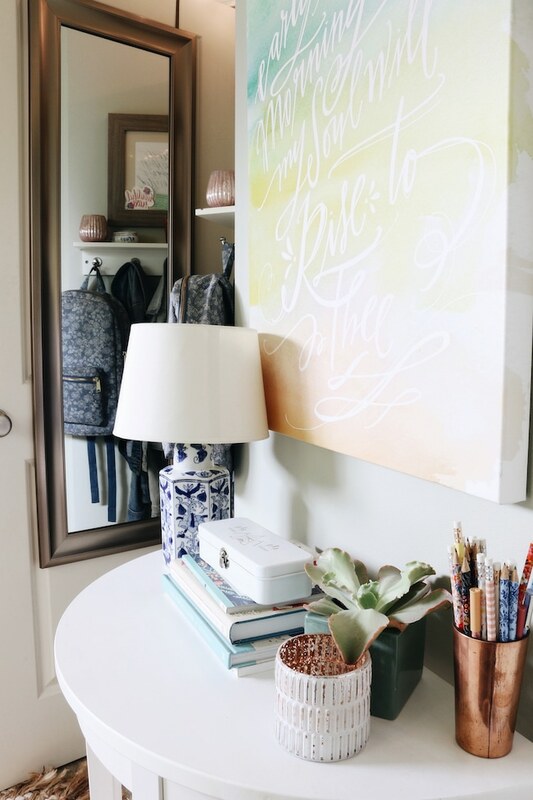 This little ottoman with an added mirrored tray has been my trusty nightstand and a coffee table, but the top lifts off and reveals that it’s actually full of shoes :) Triple-duty for the win. This sisal rug has been a great addition to the room, too. I love the subtle pattern and texture it brings to the space. I wanted to use this angled wall as a spot for a little ‘entry’ table. It was surprisingly difficult to find the right size table for this wall! I tried a few options before this that just weren’t right. I ended up finding this great console table from Ikea with a shelf below for books. I knew I’d constantly run into the corners of a rectangular console, so the curved shape was perfect. 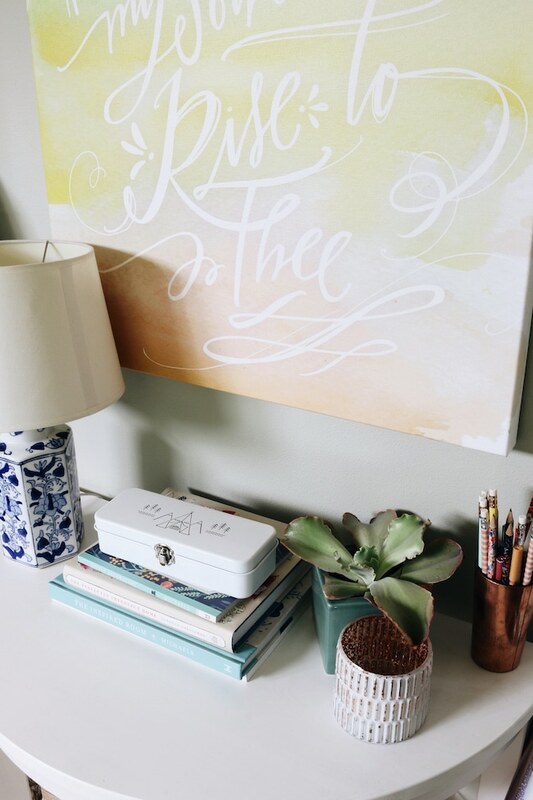 The pretty canvas is from the talented Lindsay Letters. String lights were a necessity in here. I rarely ever use the overhead light because these are so warm and magical! 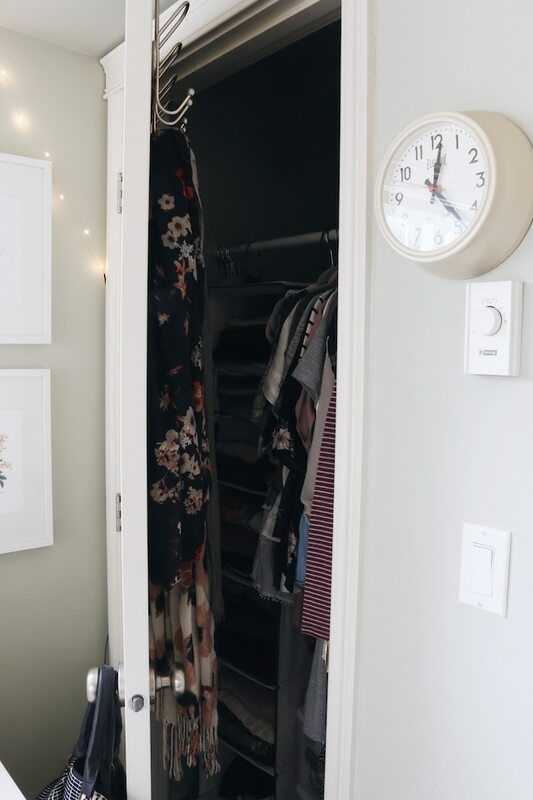 One great perk I discovered with this small space is that in order to access my closet, I had to make my bed first thing everyday. Not just because my mom told me to, but this corner is where I staked my extra pillows stacked at night. So, in order to even get to my closet, I had to make my bed. Ha! Small space problems. I would have made my bed either way, though, because a tiny room with an unmade bed as the main feature would just not be very inviting. I added a tension rod to my closet, a hanging shelf system, a plastic drawer unit, and over-the-door hooks to maximize every square inch of my space. There’s my bathroom, also on the small side but definitely not the tiniest! This right here is the main reason I survived in the storage department. 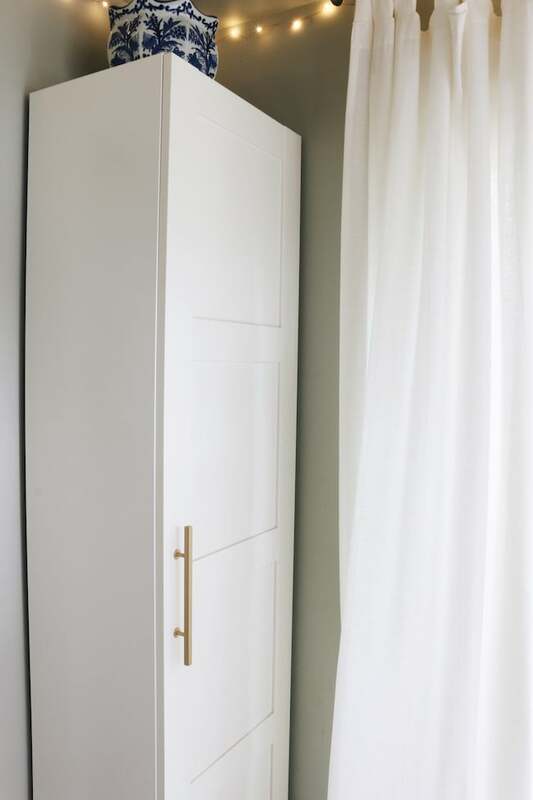 It’s the IKEA Pax Wardrobe with the Bergsbo door. It comes as an empty frame that you can customize with shelves or drawers inside. I added multiple shelves and a soft closing drawer. Thank goodness for closed storage! 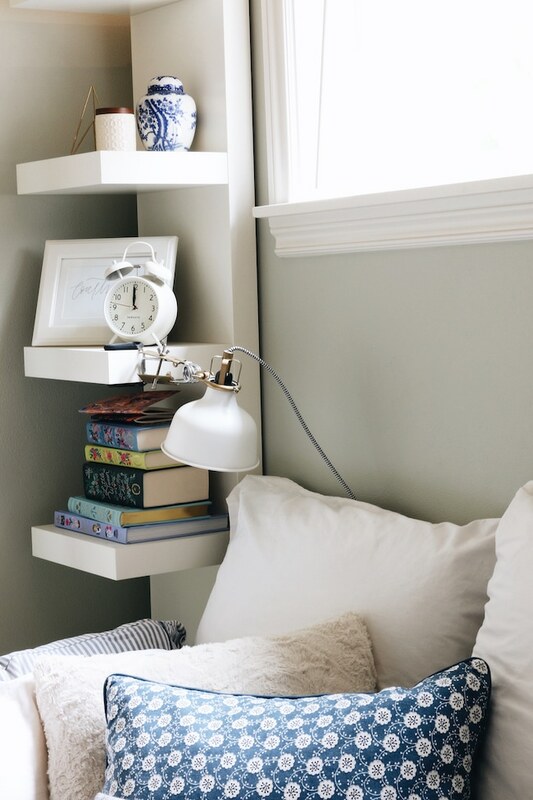 Having these shelves concealed kept the room feeling calm and simple instead of chaotic. I also added this gold handle in the 10.5 inch size. I had to use a drill to make this happen, people. Very proud of my DIY skills. 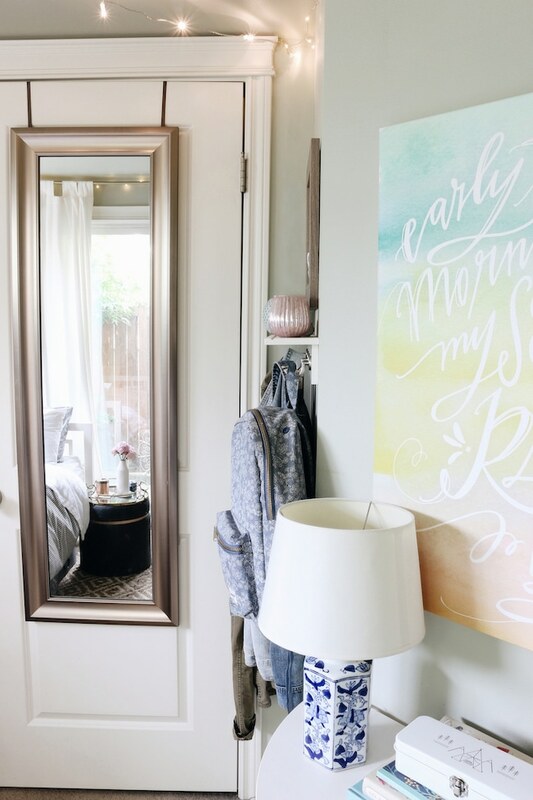 An over-the-door mirror helped to visually expand the space and bounced in some extra light, too. This right here is my mudroom. Hahaha. 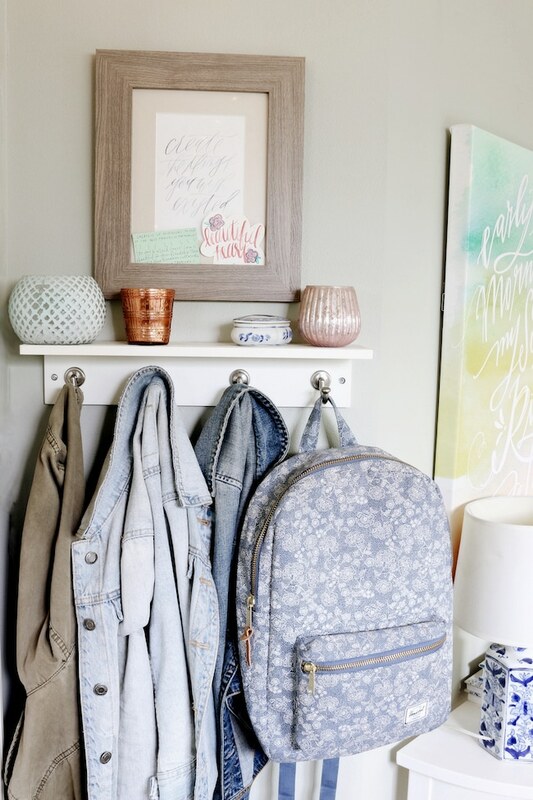 But seriously, these hooks behind my door were a great spot for coats or bags. I love the shallow little shelf for styling, too. I layered a couple of rugs in here to jazz up the wall to wall carpet and make it feel homey. I hope you enjoyed my tour today. I’m excited for the adventures ahead as I move into my next home. Don’t forget to come follow me on Instagram to get a sneak peek of my new Seattle apartment and watch my stories as I move in this weekend! Click through the thumbnails above to shop! What a cute, little room! I am genuinely impressed with how much you got in there and how inviting you kept it. 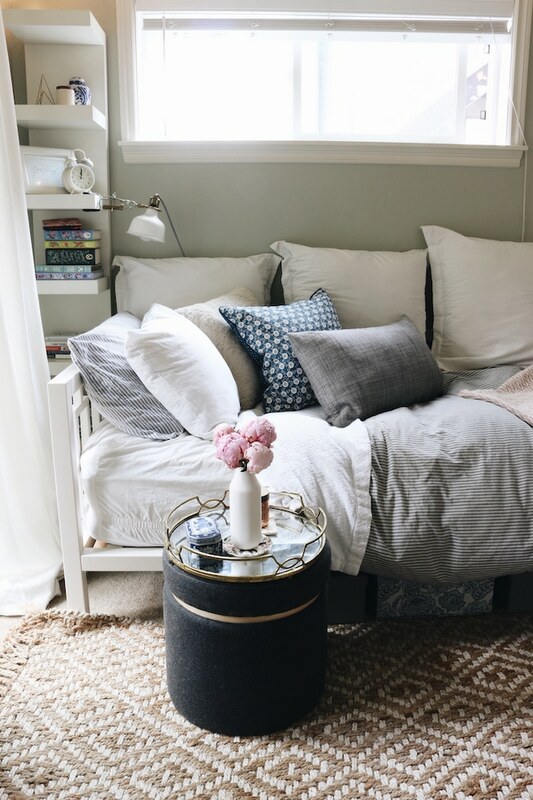 You did a great job of decorating this room and showing us what can be done with a tiny space. 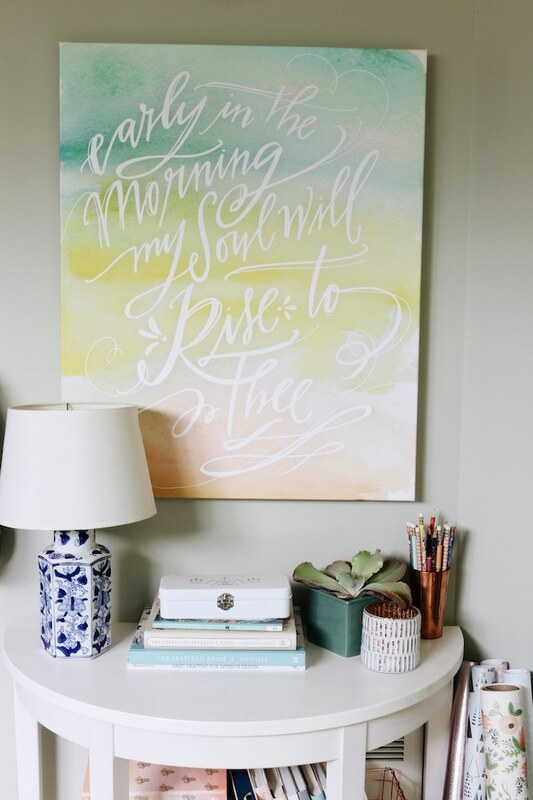 Since I have a room similar to this, I am appreciative of this post! I’m so glad to hear that, Linda! Thanks! First of all, what a great sister and BIL – having that kind of love and support from family is priceless. And that room is beyond beautiful. You did a fantastic job with the space and making it functional. Best wishes on your launch! Yes I’m so grateful for that! Thank you so much for your kind words! Hi Courtney! omg! You have created such a beautiful space for yourself! It just goes to show that you can create your own little sanctuary no matter how small the space. I love all the details and textures that give your room that designer look. Yet, the feel of total comfort. :) And Congratulations! I can’t wait to see your new home! Hi Maria! Aw, thank you so much for your nice comment :) I can’t wait to share more! 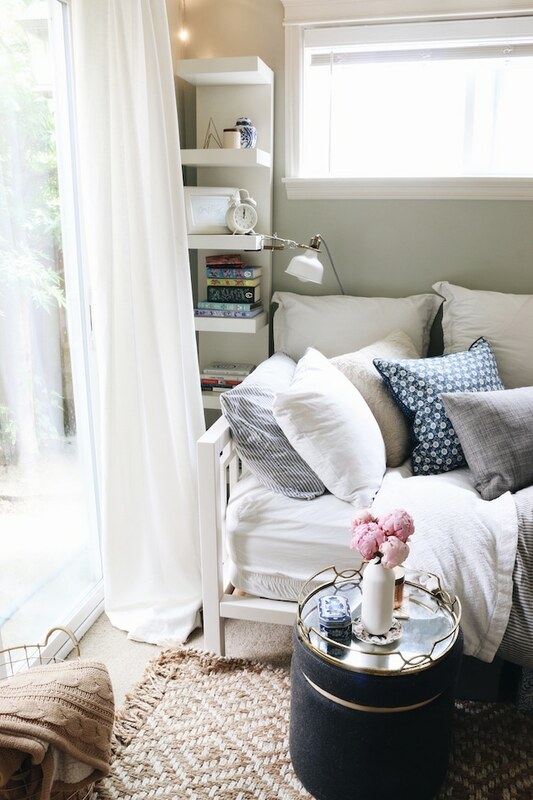 This space is adorable and so livable. Well done! Can’t wait to see your new apartment! Thank you so much! I can’t wait to share! Congratulations on your new place, Courtney! After what you’ve done to make your first little place a real home, I can’t wait to see what you do in a whole apartment! You’ve certainly got your mama’s flair! Aw thanks Sallie, I appreciate that! Looking forward to sharing my new place! Thank you so much for your sweet comment, Jo Jo! I definitely felt like it became like a little studio apartment! 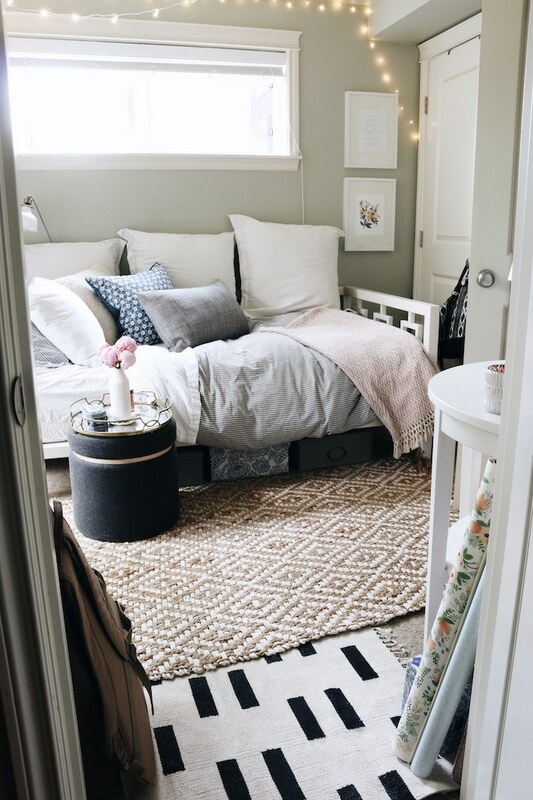 :) Love that you have a similar rug, I love how it goes with everything! I can’t wait to share more, thank you for being excited to follow along! Courtney, What a great use of such a tiny space! So cute! I don’t use Instagram–I’m a dinosaur :-) so will look forward to your next blog post. Congratulations on your new home! I’ll look forward to seeing it on the blog, too. Blessings! Well done Courtney! Really looking forward to your photos of your new space! Congrats!! Thank you Hong! :) I can’t wait to share!! Court!!! This is so so cute I love it and it’s just so you!! Best of luck in your new apartment I can’t wait to see what you do with it!!! 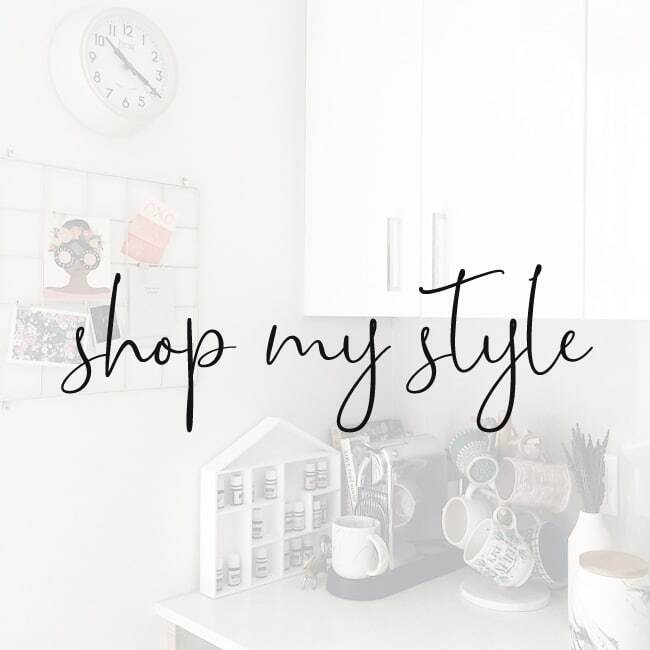 Love your space and style! Very calming and cozy nest. 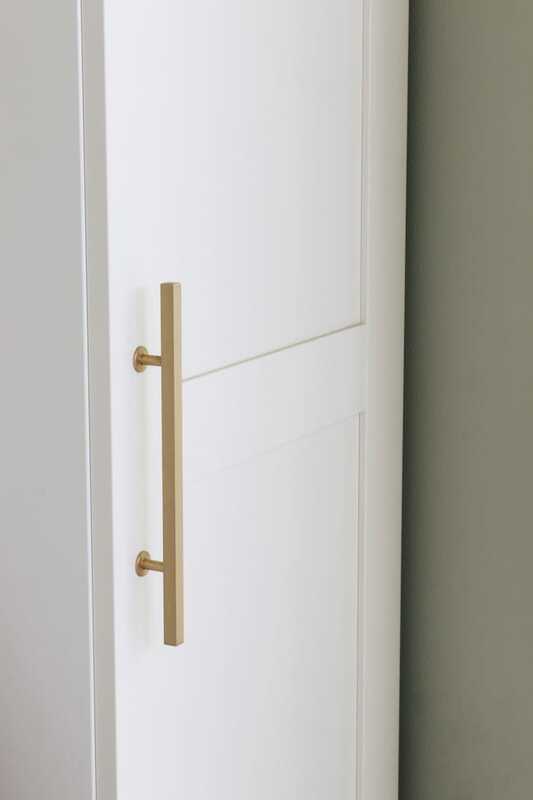 Oh, the IKEA Pax cabinet with that door and gold pull is so pretty. Have to ask, what color did you use on walls. Can’t wait to see your new place. Thank you, Yvonne! I’ll have to check on the paint color the next time I’m at my sister’s house, I think there’s a leftover paint can there so I’ll get back to you! Courtney, I am sooo excited for you! I am eager to see your new digs, but you totally made the best of this basement dwelling. Cheers! 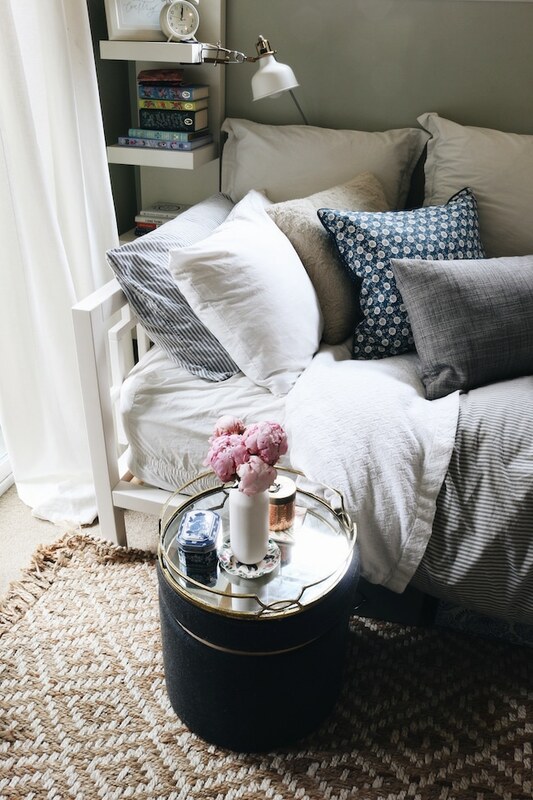 I’m obsessing over all the beautiful details in this lovely little room!! So much wonderful inspiration for the many, many times I find myself helping my girls and others maximize limited square footage. It is cozy, inviting, and inspiring — everything a room should be. Congratulations on your new space too! 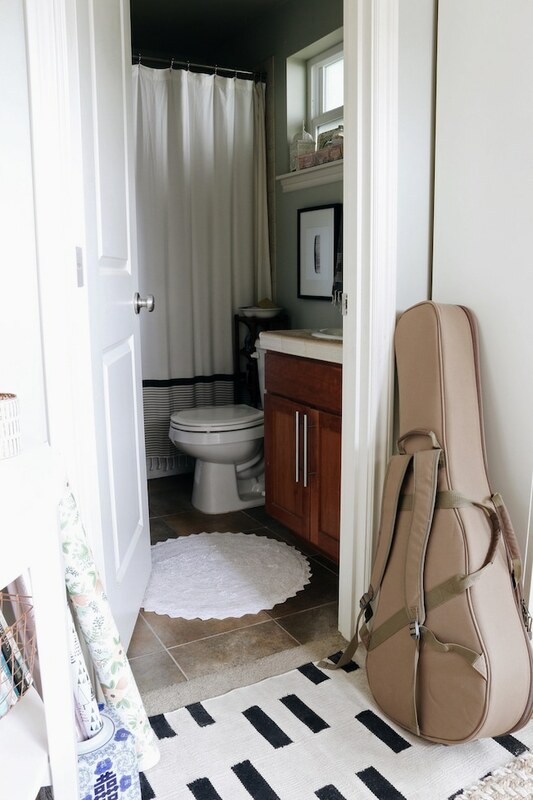 Great job on the small space! You’ve managed to keep everything you need with enough moving area to make it feel homey. Looking forward to seeing the new place. Thank you so much, Elaine! That’s what I hoped! :) Can’t wait to share! Lovely! I like every little detail you used to make the room cozier. 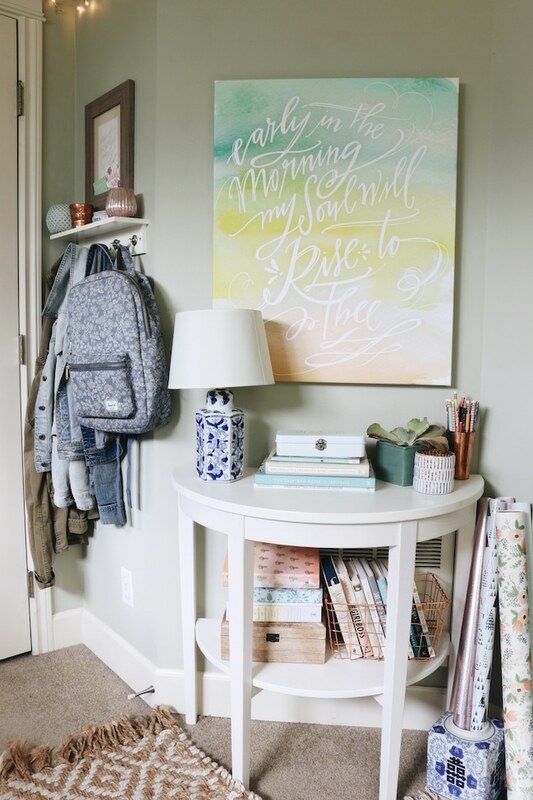 Courtney….what an absolutely lovely room. I can’t believe all the perfect touches you used to maximize your space with such beauty! I can’t wait to see your new home and the touches you put in it!!!!! Thank you so much for sharing this lovely space!!!!! Congratulations!!!!! Courtney you did a great job,really yor room looks like a tiny apartment i didn’t realized that it was only a room with a bathroom.I wish you good luck with your new apartment and i will be waiting for photos to see it. Also i can understand that you love this tiny “house” . You actually did a great job maximizing a very minimal space, Courtney. I really like the bookshelves as it looks perfect for small spaces and that console table looks really great on the angled wall. What makes this room much more comfortable is it has its own bathroom. Overall, you have a wonderful room for yourself.